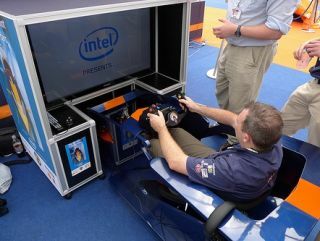 Intel has announced that its Atom processors will be integral to the 1000mph car Bloodhound project, with the chips featuring in the engine control and display systems. The Bloodhound car project has attracted huge interest, with talk of the first 1000mph car inevitably stirring up huge amounts of excitement. Intel has announced that its processors will be a key component for the Bloodhound, helping to manage the Typhoon fighter aircraft engine which will propel the car. "The processors, similar to those used in netbooks, have been specifically designed for use in industrial and automotive applications, and were chosen for their power-saving and performance prowess," explains Intel's release. "Three Atom chips will manage the calculations behind the car's "hybrid" propulsion systems – the largest hybrid rocket ever designed in Europe - included in which is a jet engine from Typhoon fighter aircraft. "Given the speeds the car will be going, each processor will be checking the others' calculations to guarantee there are no errors. "Another processor will also be used to relay this and other status information, stored on an internal SSD chip, back to the driver on the cockpit displays." The other processors - up to four of them - will help the 'driver', Wing Commander Andy Green, to keep the car on a smooth trajectory. "This is an important engineering milestone, and yet another great example of the close collaboration between Intel and Bloodhound," said Mark Chapman, Chief Engineer for the Bloodhound programme. "The Atom processor has impressed us with its power-saving, performance and resilience and thanks to this we have managed to use fewer processors in the car – saving on vital weight and space"
The announcement was made at the 2010 Farnborough International Air School, where Intel also showed off a simulator of the Bloodhound, developed alongside Southampton University. Intel is hoping that the Bloodhound project will inspire a new generation of engineers and scientists. "Intel recognises that globally there is an increasing shortage of science and maths engineers to help drive the next generation of innovators for the 21st century," said Tim Hatch, education spokesperson for Intel UK. "Core to the heart of Intel's Education program are STEM subjects and the similarity to the aims of the Bloodhound education programme is one of the main reasons we formed this partnership."